The clock of the Zwolle Central Station with its plus and minus signs neon lights is an Energy Sculture. 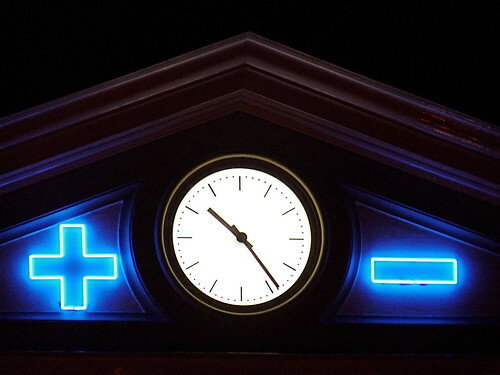 Installed in 1989, a sculpture of Jan van Munster (1938 Gorinchem), neon lights (in the color blue of Zwolle) 60 x 60 cm. Van Munster sees the station as a battery, from which the city generates energy, live and motion. That's why he added a plus and a minus sign to the front clock of the station. (Source: Kunstwegen).